The Cosmic contains all that is and all that ever will be. It is the Divine Breath of the Creative Universe, that which we experience. It is that which we see, hear, touch, taste, and feel. This can be felt with our Physical Senses and with our Psychic Senses. It is that with which we Create our very lives and actions in this and all worlds. All that we allow in our lives will be the taste of our lives. 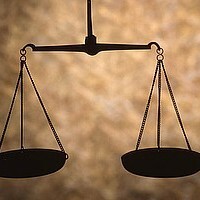 The scales below are in balance. This is representative of the Center of our Being. We command the Inner and the Outer Worlds and experiences. Many individuals, cities and companies are going Green in California. In a local town the residents just recieved a gift of Compost and a cute little recycler for food scraps and paper from foods to collect our potential mulch in. It is to be emptied in the Large Green Yard Clippings Recycler, and the city picks it up. This is very commendable. It is good recycling. It can be improved upon by becoming an "Organic City..." All food being available can be Organic and at a price everyone can afford. The amount of funds that can be generated by the sale of recyclables as we know can help a City. Should it not help the residents of that City as well? After all the Residents are the ones buying the products to recycle. The mulch could be available to residents for a "City Price". A Resident Price at a discount, for appreciation of participation in the program for City Mulch Program. Many people would participate if Organic Food and Organic Mulch was available.